Why does no one talk about suicide? Suicide is still considered a very taboo subject to talk about. It is difficult to discuss as it is a hard concept to grasp - the idea that someone wants to take their own life. But isn't this more of a reason for us to speak up about it? Something I have been noticing for quite some time is how the news and press are very reluctant to ever mention the 'S' word. Just today I read a news article about a woman 'falling' off a bridge on to a busy motorway. No suspicious circumstances. She wasn't pushed. No further enquiries necessary. Etc, etc, etc. It's always the same words, the same closed cases - because they know, they know that the victim intended to end their lives. But they can't report it because nobody wants to face the truth of it. I know that it is a sensitive and altogether awful subject. I by no means wish to bring anyone down in discussing this, but as with all mental health issues, communication and education is what can save someone's life. Although the papers don't report it, a statistic given by Samaritans shows that 6,122 suicides were registered in the UK alone in 2014. How many of these made the news? How many of these were reported as 'accidental deaths'? Suicide is one of the highest killers in men, as it is often found that men are more reluctant to seek medical help than women. The 2016 Samaritans Suicide Statistics Report also found that the female suicide rate is at its highest since 2005. Suicidal thoughts are regular occurrences for some people. They are often by-products of other mental illnesses and traumas. It doesn't discriminate and it can happen to anybody. We have to talk about things like this in order to gain an understanding of how serious it can be. 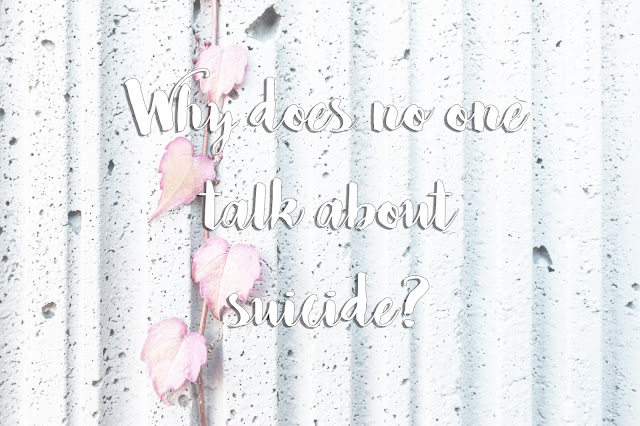 It is also important to remember that just because someone is having suicidal thoughts does not necessarily mean that they will commit suicide. I myself have suffered with many bouts of suicidal thoughts - nights where I've been up until 4am thinking about how I wanted nothing more than just to stop living. That never meant that I would go through with it. But talking about it, being open about these thoughts and emotions, feeling like there is a genuine support network out there and help is available, are all things that can help stop the suicidal thoughts in their tracks, before anyone feels like there are no other options. To anybody who feels like they are struggling at the moment, remember that there are options and that your life is precious. It doesn't always feel like that - I can think back to many times where I've felt like my own life was a massive weight in my chest. But there are people who care about you, love you and want you to be happy. I will list some resources below, like helplines and websites, that hopefully you will find useful if you're going through a difficult time. As always, remember you can drop me an email, Twitter DM, Instagram DM or even a Facebook message if you feel like you have nowhere to turn. I believe in you! Remember to call your local emergency services (UK: 999) if you are in real danger.